The 2009 Amarone della Valpolicella Classico Riserva Capitel Monte Olmi is a wine of massive proportions and aspirations. This vintage marks the first time that this single-vineyard Amarone Classico is a Riserva. Capitel Monte Olmi sees a meticulous blend of up to eight indigenous grapes, all aged 48 months in barrel. It would be hard to exaggerate just how big this wine is. 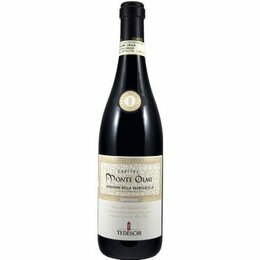 It shows its muscle in terms of chewy sweetness as well as the tightness of tannins that you normally do not encounter in Amarone. In fact, the wine is so big, it requires at least five more years of bottle aging to reach better integration. The Tedeschi family produces wines that are always unique and distinguished. Personally, I have had a love versus hate relationship with the high residual sugar that you often get with their products. This set of new vintages seems to put all that sweetness on proud display without being too heavy or cloying as I remember them being in past vintages. The flagship wine, the Amarone Classico Capitel Monte Olmi, is now a "Riserva" for the first time.